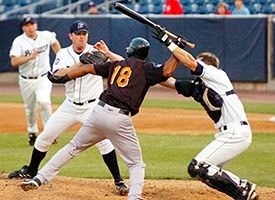 Many may remember an incident way back when in August of 2007 when a minor league batter in Connecticut, reacting to being hit by a pitch, charged the mound and attacked the pitcher and catcher with his bat. Many may also remember that the batter was one-time Red Sock Jose Offerman. Of course, Offerman was suspended and lawsuits were filed, to which Offerman pled not guilty to charges of second degree assault. But it gets more bizarre. As the case is finally set to go to trial more than six years later, no one can seem to get a hold of Offerman. According to the Associated Press, J. Craig Smith, Nathans’ lawyer, tried to serve Offerman discovery documents recently to no avail and expects him not to show in January when the trial actually begins. Smith said Offerman hasn't appeared at any of the court proceedings. Offerman is a citizen of the Dominican Republic who has lived in the New York City area, including Queens. A phone listing for Offerman could not be found. His lawyer in the lawsuit, Frank Riccio, who died in March, withdrew from the case in 2010, saying in a court document that Offerman refused to discuss the case with him and hadn't paid him. Riccio's son, Bridgeport attorney Frank Riccio II, said Offerman apparently has been out of the country for some time, and he has not talked with him recently. Riccio said if Offerman ever returns, he'd likely represent him. Hopefully this won’t hinder Nathans’ quest for at least some of the $4.8 million in damages he’s asking for. Yahoo says Nathans is now working as an attorney in Portland, Maine but still suffers from inner ear problems. "Some days are better than others, but it's not a problem that anyone else would want to have and it ended his baseball career," Smith said to Yahoo. "He's able to function, but that has a lot to do with his personal drive and ambition. He's not going to allow this to keep him from functioning on a high level in the real world."